Hilton, Marriott, and Four Seasons (in that order) have the highest “conversational relevance” in online discussions among leisure and business travelers, according to a study. The conclusion is based on an analysis by Brodeur Partners and MavenMagnet of what is "relevant" in online brand conversation. The study measures brand resonance across thousands of online conversations. "We wanted to go beyond speculation and opinion, and really see what drives online behavior, in this case, conversation, around different hotel brands," said Boston-based Brodeur Partners CEO Andy Coville in a release. The “conversational relevance” scale is a measure of how much people are talking about a brand and how impactful and positive that conversation is. Brodeur and MavenMagnet parsed more than 18,000 online conversations between May 2012 and October 2012 across social networks, profiles, forums, news Web sites and blogs. "We looked not only at practical considerations but at how the brands resonated with hotel guests' senses, values and social needs, which are the other dimensions of Brodeur's relevance model," said Jerry Johnson, Brodeur executive vice president of strategic planning, in a release. "When a brand is engaging all four dimensions, it inspires strong feelings and an abiding loyalty in those who experience it." The group used proprietary technology to tap into the “collective intellect of engaged consumers” -- in this case, consumers sharing their experience about travel and hotels, said Aditya Ghuwalewala, founder of NewYork-based MavenMagnet. The top hotel brands in the analysis displayed highly positive overall “conversational relevance” scores based on positive/negative buzz differential, with Hilton earning a 58% score followed by Marriott (56%) and Four Seasons (51%). The analysis also looked at each of the 10 brands' attributes through Brodeur's four relevance pathways: Functional, sensory, values and social. Functional includes practical attributes people care about like service, location, rooms, recreation and rewards programs. Comments in this area dominated the conversation about hotels. Marriott, Hilton and Sheraton were the winners here. Sensory covers attributes that appeal to all five senses like the view and water pressure in the shower (which surprisingly eclipses bed comfort in online attention). Ritz-Carlton and Hilton led the category. Values includes attributes that reflect personal values such as the hotel's service ethic and commitment to indulging patrons. Four Seasons dominated. And finally, social covered attributes related to customer status, such as the brand's cachet. Four Seasons dominated here too. The analysis further broke down results between leisure and business travelers. 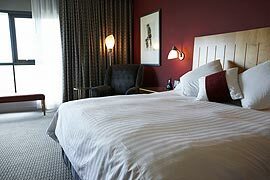 Room cleanliness, for example, means more to business travelers than leisure travelers. It's the other way around for recreation.